When a nutritionist creates a recipe for a horse feed they can either create a ‘set recipe’ for the feed OR a ‘Least Cost Formulation’. So what do these terms mean, and which is better? Least cost formulations are not unethical. When done correctly they will provide the amount of calories (energy), crude protein, vitamins and minerals as specified on the label. However, the ingredients will change and protein quality can be compromised. So whilst Cottonseed Meal is a cheaper source of crude protein compared to Full Fat Soybean, it contains ONE THIRD the digestible Lysine. So the protein quality is inferior to Full Fat Soybean. 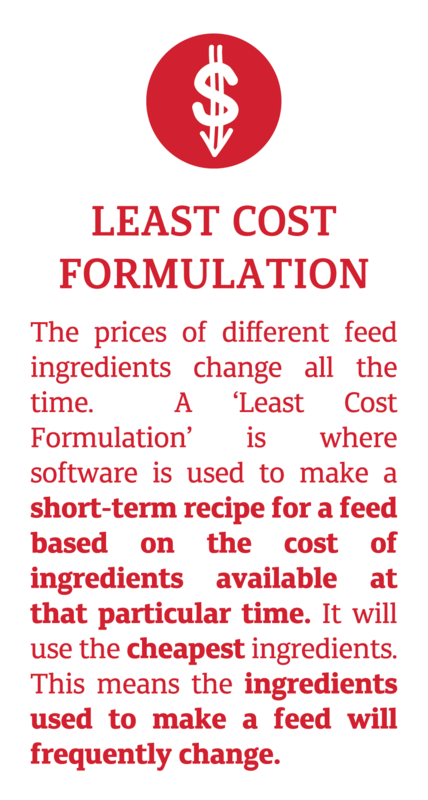 This is the issue with Least Cost Formulations. Because least cost feeds are made using the cheapest ingredients available you almost always end up with poor quality protein. And this will limit a horse’s ability to grow, build muscle or make milk (as per the previous pages on protein quality). HOW CAN YOU TELL From the Label? Read the list of ingredients. Feeds made to a set recipe will contain a very specific list of ingredients like ‘Barley, corn, wheat, soybean, lupins, faba beans, canola oil'. Feeds made using least cost methods will include vague ingredient listings like ‘cereal grains and grain by-products, vegetable protein meals and vegetable oil’ to give the flexibility to change the ingredients used as ingredient prices change. At Pryde’s, we think you should know exactly what you are getting in a feed. So all of our feeds come with a full listing of the specific ingredients we use to make them. We are also passionate about premium quality protein, so our feeds always use high quality protein and every single Pryde’s feed is made to a set recipe.